Do you really need a spare tire? Recently on LinkedIn, a connection of mine shared that he had taken the spare tire out of his car in an effort to increase gas mileage. His rationale (which has been proven by automakers), was that a lighter car would get better mileage. His post drew swift and divisive commentary from quite a few folks, but it really got me thinking: Do we really need a spare tire in our cars? What do you do if you get a flat and have no spare? Even AAA can’t help you at that point. Most spares nowadays are just small “donuts” that barely weigh anything, so would you even realize any mileage gains (outside of the normal standard deviation) by not having it in the car? No one pays more attention to CAFE regulations than the manufacturers, and they still include spares, so they must have all done this analysis and decided against omitting the spare… right? Never being one to dismiss concepts, however, I spent some time considering this idea and challenging my initial thought process. After some time looking at this from different perspectives, I can actually see that it might have some technical merit, both from PFMEA and a Lean perspectives. Those of us who live in the manufacturing world are familiar with the term RPN, but for those who do not: an RPN (Risk Priority Number) is a somewhat objective way to “score” risk of a process to determine if it’s worth taking action to prevent a certain failure mode from occurring. This number is the product of three categories as scored from 1-10: Occurrence, Detection and Severity. For purposes of this discussion, I’ll focus on the Occurrence piece. I’ve been driving for 25 years and have covered roughly 500,000 miles. I can count on two fingers the number of flat tires I’ve had, and one of those didn’t need a spare on the vehicle (it was sitting in my driveway). So, the data tells me that I can expect 1 occurrence of a flat every 25 years/500,000 miles for which I’d need to have a spare on the vehicle. That’s a pretty good indicator that I shouldn’t carry a spare – the data suggests I won’t need it. In a market that advertises storage space down to the decimal in an effort to edge out the other guy; wouldn’t the space taken up by the spare and jack serve a better purpose? From a Total Productive Maintenance perspective, it also may not make sense to carry a spare tire for the same reasons as noted above. One of the goals of TPM is to have critical parts on the shelf so that, should a piece of production equipment go down, you can get back up and running quickly without having to order and wait for a part (this is measured as Mean Time To Repair, or MTTR). If I had gone to any of my former Plant Managers and asked to buy a part for a machine because I may need it in the next 25 years, I would have gotten laughed out of his office. You could argue that a spare tire is critical to the operation of a vehicle, and I don’t think I would disagree – it’s certainly one of those things that you need when you need it, but again – the data suggests that you probably won’t. Using that same thought process would mean that you should carry lots more spare parts than just a spare tire. Many of us carry jumper cables in the event that our batteries die, but not everyone does, and the manufacturers don’t include them with every new car sold. Why not? Would these not fall into the same category of urgency as a critical part? What about spare fluids and belts? Where do you draw the line between what’s reasonable and what isn’t? Part of having parts “on the shelf” is knowing that they are ready to go – they are in good working order, and are stored in an area that is well 5S’ed so they are easy to find and get. I worked with one manufacturer who struggled with this portion of TPM. Although they were pretty good at identifying and collecting the critical spares they needed, parts were stored in all sorts of disarray (sometimes outside! ), and anytime they needed something, they had to first remember if they had it and then go hunting for it, junkyard-style. This wasted time, and on at least one occasion, the “good” spare part turned out to be garbage, saving nothing. For this example, I honestly have no idea if the spare under the bed of my truck is ready to go or not. As I mentioned – I’ve never used it, so not only might it be flat itself, its “cable-lowering” system might be stuck by dirt and grime after having endured 7 New England winters… and really – does anyone pull their spare tire out and check it periodically? Along that vein, I considered the operator training piece of the puzzle. Although the owner’s manual clearly explains Standard Work, I wondered how many people could actually change a tire. To answer, I turned to social media with an impromptu poll and simply asked “If you had to change a tire, could you do it?” I was surprised by the outcome: 16 people said that they could, while only 4 said that they could not. 1 response was especially intriguing – that person can change a tire, but wouldn’t have to – their car doesn’t come with a spare. 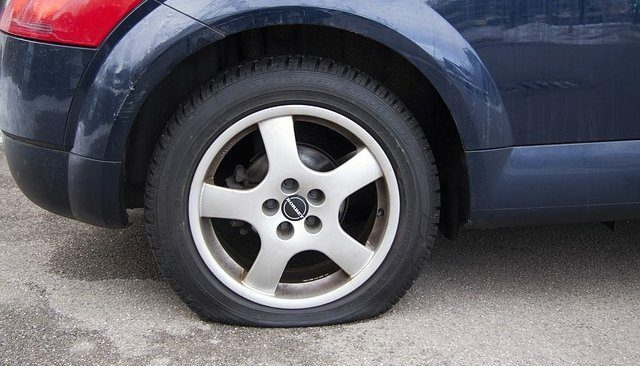 Many cars today do not – they come with “run-flat” tires (which would seemingly be a much better solution to the problem than carrying a spare tire, but I digress). In her case, Chrysler provided her with a can of “Green slime” – a pressurized can filled with goo that serves to plug whatever hole has developed and fill the tire enough to get you to safety. I’ve never used these, but know enough people who have to know that it’s a less-than-ideal proposal. If you don’t get it right with your first and only chance, you’re just as stranded as if you didn’t have it! Given all of the above, I still wonder if carrying a spare tire is worth it or not. As an engineer, my intuition tells me that the best option is to have all cars come with run flat tires. I don’t know if the technology is there yet to cover all shapes and sizes, and even if it were, it would certainly add to the cost of a new car, which no manufacturer I’ve ever worked with would welcome. However, some new cars do just that, while others carry the “green slime” option and still others have evolved from full-sized spares to the small “get me there spare” in efforts to save weight, space and cost. In a few cases, vehicles still carry a full sized spare. So, apparently the auto manufacturers haven’t decided, either. It is a fun concept to consider, though! New England Lean Consulting is a full service Lean partner serving Maine, New Hampshire, Vermont, Massachusetts, Connecticut and Rhode Island. We offer comprehensive Training programs as well as direct Consulting services. Contact us at www.newenglandlean.com for more information. Posted in Blog and tagged connecticut, lean, lean management, lean manufacturing, maine, massachusetts, new hampshire, rhode island, vermont.